UPDATE, 5/16/2011: We are no longer updating the site regularly, as other resources have had a chance to collect comprehensive information. Visit the headers at the top of this blog for additional resources, but please contact the site to ensure they are up to date before visiting or donating. If you would like to donate in the Hudson Valley or Albany, NY areas, please contact me. Thank you so much for all of your support. Some people have asked how they can help us keep the blog going. We're happy to do it and can keep going without contributions; please direct your donations to other organizations in the area. Our preferred choice are the two UA SLIS donation sites, which will go directly to the faculty, staff and students in our program; any extra will be distributed to other relief efforts on the ground in Tuscaloosa. They can be found under the "Financial Support" heading. Update (5/1, 5:05 p.m. EST): Please look at Supply Donations which has been revamped and updated and Financial Support which presents double the number of charitable organizations that are providing aid to Alabama and those states damaged by the tornado. Give goods or give money, you are sure to find an organization that addresses your personal philosophy. Update (4/30, 8:30 a.m. EST): Last night we moved most of the information onto subpages, which you can access from the links at the top of this page, or by scrolling down. This should make it easier for people to find exactly what information they're looking for quickly. Some new content has been added, such as the Insurance section under Information Resources/Lost and Found. Those donation drop points which had Friday deadlines have been struck through but not yet deleted. As relief efforts get organized on the ground, so they do online. There is so much more available information than there was 24 hours ago. We look forward to gathering it for you here at Legislative Barbie. Don't forget to comment with updates to the lists! We are trying to include all the information we come across, but we can get your event or site listed much faster if you come to us instead of waiting for us to find you. Thank you! We've collected some information on ways that DE students and/or alumni can help. While we aren't experiencing the immediate effects of the tornado in Tuscaloosa, but the feeling of helplessness and frustration can also be overwhelming. Hopefully one of these resources or ideas will be feasible for you as we join together in support of our friends, professors and colleagues in the Tuscaloosa area. We will send updated information to SLIS-L as it becomes available. If anyone is aware of additional information, please feel free to email Turner.Brittany AT gmail DOT com, call 916-384-6735 or comment on this post. We will include your relief suggestions in the list. This blog post will be updated any time new information becomes available. The most needed resource is financial support, as money can be used to facilitate any combination of recovery efforts when they are needed most. This includes clean up, food, shelter, and other emergency services. If you are unable to offer financial support, there are a number of other options available to help. Also, remember that this will be a long-term effort. While there may be many donations now, additional support will be needed in the coming months and your generosity may be spread across an extended period of time to sustain efforts in Tuscaloosa. Host a fundraiser in your own community. Ask friends, neighbors, and local stores for donations of needed supplies. If you are nearby, consider volunteering for cleanup and service work. Many organizations, such as the Red Cross and Salvation Army, train people and facilitate volunteer efforts in communities experiencing natural disaster. Contact your local center for additional information. Organize a community-wide relief day in your town. Ask that local businesses dedicate a percentage of proceeds from the day to tornado relief in Tuscaloosa. Such a nice post to share. For Folks in the Birmingham Area Fox 6 and Bruno's on Hwy 150 and Hwy 31 will begin to Accept Donations Today starting at 2:30.Please come by. Text "REDCROSS" to 90999 to make a $10 donation to the American Red Cross if you want to help those affected by the storm that hit Alabama. We need your help. Master's House Ministries will be delivering food (ready to eat) water, baby food, diapers, & wipes to tornado victims. Please drop off items @ 135 Corporate Way, Pelham,AL or call 205-276-9863. We will also be separating clothes at the church tonight @ 6:30. WE NEED YOU ALABASTER, PELHAM & surrounding areas. Thank you & God bless!!!!! The Bruno's Supermarket location in Hoover on the corner of Highway 31 and Lorna Road has begun a bottled water drive for victims of Wednesday's storms. Bottled water donations can be dropped off at the donation truck. The truck will be arriving at Bruno's around 2:30 p.m.
Officials with Bruno's say to not bring anything besides bottled water. West Jefferson County is being advised to boil their water for at least 10 min and then let it cool prior to use. The water works was heavily impacted. My husband & I would like to come to Alabama & help,please notify us on the "how to". Our email address is hacm1111@yahoo.com. We live in Georgia & are willing to travel .Our hearts go out to you all.We will be praying for you ALL,God be with you.Contact us . Be blessed! Tina & Raymond Page Commerce,Ga. If you still need admins for the blog, let me know, I'll be glad to help. Ok here is a way for everyone to give. Will not cost you a dime. If you text SABAN to 90210 $5 will be donated to Alabama Red Cross. This will not come out of your bill. This will come from Crimsonhoundstooth.com. All you have to do is text. Brittany, thank you for putting together this list -- it's going to help a lot of people. And thanks to your readers for helping us in Alabama in our time of greatest need. God Bless The area's of the South who sustained such damage hopefully those who can will donate to help ! I do not live in the effected areas, but I am a distance student at The University of Alabama and my heart goes out to my fellow students, the faculty and the citizens who suffered through these terrible storms. God Bless them and those involved in the relief efforts! I have been looking for ways to help and your list of ways and places to help/donate is the largest and most detailed I have seen, so thank you for compiling it and sharing it. I have already shared it with a few links on my facebook pages! Does anyone know if the old downtown area of Tuscaloosa was damaged or the old Tuscaloosa high school ? The old TTown High school was torn down months ago. But no it was not damage here. Visit our page on supply donations at http://legislativebarbie.blogspot.com/p/supply-donation-sites-all-states.html - even if we don't have something nearby (yet), we are updating it constantly and also have information on where to mail your supplies. Thank you for the links, the tornado path, according to the link you provided indicates that the tornado was about about a quarter of a mile south of the old Drish house on 17th, and hit an apartment complex on 10th Ave and 27th called the Charleston Square apartments and then traveled North Northwest to 15th and Mcfarland and hit the University mall and the Wood square shopping center and then went on hit the Alberta City area. Thanks for the information, I have a friend that lives near the old downtown area and it didn't really reach that area. My condolences goes out to all the people effected and those who have lost loved ones and thank you Brittany for reaching out to help. 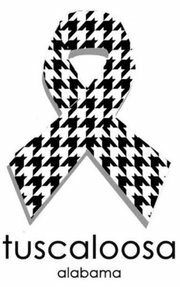 Are you or have you thought of selling the houndstooth ribbons to raise money for tornado relief? Great site. Keep it up the good work. To the extent that the subject matter is concerned you have chosen a truly fine and hot topic. this is completely to the point and it is giving the full explanation of subject.thank you. i am impressed by your lovely post which i were really looking for. I would state that you possess lots of understanding on this subject and you wrote outstanding. The information which you had posted about the Tuscaloosa, is very interesting. And I am really very keen to help such people who are orphans and poor. You have done good job by posting such a great post. Thanks for the information - very helpful. I wish I could donate to support the work of this blog and hope you find the time and resources to continue the publication. Like all of you when I heard the original lineup had reunited for "Astronaut" I was thrilled. Not quite so thrilled when I heard the disc. Granted "Astronaut" had some great moments but that was not the comeback I was hoping for. I skipped "Red Carpet" all together due to the reviews from fans and critics. Then without even realizing DD was coming out with something new, this caught my attention on our local newspaper. Not quite the hippest place to find out about a new DD album but that's it. Hello there. It's a great thing to keep your readers and subscribers posted especially if it concerns donations. We must make sure that these goes to the right organization. Thanks for this post. We support all your causes. Hi author, Have you considered adding some relevant links to the article? I think it might enhance everyone’s understanding. Great article. Really helped my understanding of the subject. Keep up the good work!! This really makes me happy....made my day! Thanks for sharing!! excellent.Great informational post with complete information on the topic. I!! agree with most points in the blog. Great article writing skills. loco no se puede leer nada! estan piolas las ideas pero no entiendo nada la letra es chica los colores son iguales, se pierde todo!!!!!! Gracias mi amigo! Wonderful commentary! Very interesting topic. Well-writtend and enjoyable to read. Keep it up! This is a nice blog regarding the health topic which is the most essential thing for everyone. I have read the whole blog and the information provided here are nice and true which should be keep in our mind. Very useful information about Remove Blue Shadows from Desktop Icons is provided by this blog and i like to visit such blog which always provides new things to learn. This blog is excellent because information provided though this article is very nice.VoIP meas voice over internet protocol and by the help of it you can make call form Pc to phone at less charges. this post is very informative and helpful for me.i am happy to see this effort and great knowledge about subject. well,i saw your post and gain alot of information regarding topic. tornadoes could have bene­fited from better efforts to coordinate and identify volunteers and workers in the aftermath of the storms, residents said here Monday in a community fo­rum held by the Tornado Recovery Ac­tion Council. hmmmm ... Due to an overwhelmingly generous response, we are accepting only non-perishable food items. They may be donated to The Salvation Army or Temporary Emergency Services. So It took us weeks just to write the application,” Morris said. “It’s essentially like writing a 40-page paper on your fraternity and what you’ve accomplished during the year. Thanks for the information..Would like to hear more..
Hello Brittany. I'm with you on your cause. I hope many people will be moved and help you. Thanks for all your efforts. Great post about uscaloosa Tornado Relief Efforts.. I appreciate your interest towards sharing the useful stuffs. Great work you guys are doing, keep it up! Hello Brittany. This is so cute and cool. I like the format of your blog not to mention its contents. Thanks so much. I want to say that I dont think Ive read anything so true in a long time. Youve got a lot of great ideas, a great deal of perspective. I think that you definitely have something important to say and Im gonna back it 110%, man. Good job keeping this subject alive and interesting! This is a better-quality article as they all are. I make fun of been wonder wide this an eye to some beat now. Hi Legislative Barbie. It's heart warming to know that many people are lending a hand to these victims. Thanks for your efforts too. Irregular bowel movements is the most common gastroenterological symptoms treated by doctors. Biceps tenodesis. A Biceps tenodesis is a procedure that cuts the attachment of the biceps tendon on the and reattaches it to the humerus. How to stop diarrhea. We will tell you what you must do when you have diarrhea, such as prevent dehydration and foods to avoid. This article provide decision tree examples, advantages of decision tree and step by step how to make a decision tree. Build a Laptop from scratch? Learn what is needed to build and create your own laptop computer from scratch. Methods to fix blue screen of death, list of BSOD error codes and why Blue Screen of Death can happen. genital herpes symptoms? The very first way you realize when you have genital herpes is from the features which will appear. Quotes from Dan Gable - Various quotes from Dan Gable "I shoot in, I get 2 points. He shoots in, I get 2 points"
Inevitable definition - unable to be avoided, evaded, or escaped; certain;necessary: an inevitable conclusion. We're completely satisfied you discovered us. On this site, we have introduced collectively an unlimited array of data and sources on this. Well If you would like to help with Tuscaloosa's recovery and rebuilding efforts, you may donate or volunteer with the local West Alabama relief agencies listed below, or contact the City of Tuscaloosa for more information on how to help. and i really glad to discuss this topic thanks for the information. Hey guys thanks for sharing the information, it was a nice content to read thanks again for sharing, keep up the good work. Hello Admin. I really admire your will to help these tornado victims. Claim your rewards in heaven. God bless you. Hi Brittany. Poor victims. I just hope that they could recover and hope that many people will be moved and help these victims. Thanks for sharing this so interesting post! !I really w ant to appreciate the way you have putted it here..Its marvelous placement.Please keep sharing such stuff in the future too as it really attract s the visitors..
Hello Brittany. You have a very noble intention of helping these victims. I'm sure you will be more blessed. Very useful for me I will bookmark this for my future needed. thanks for a great source. HI Brittany. You are a gift to these victims. You will be rewarded with your good deeds. Hello there Brittany. Thanks for all your effort of posting this blog. I'm sure people will be moved and donate or lend a hand to these victims. I appreciate spending some time to talk about that, I believe firmly regarding this and so really enjoy understanding more about this kind of subject. Do you mind adding to your blog with additional insight? It will be quite helpful for anyone. The stressed that nearly all of the tourists who demonstrated the described behaviours were mentally ill prior to their arrival in jerusalem.Thanks for sharing informative post. Love to read your article. i am glad to appreciate this. i wish that i get such information on and on. thanks for the post which is inspiring people to move in such a way. It is really touching to know that many people still care despite the busy modern world. Your story is really a great inspiration. I hope more and more people will join the org. More power! I must explain, your publish will go to the nerve of the subject. Your pellucidity leaves me seeking to know much more. Just so you already, i will instantly seize your feed to keep up thus along with your web website. Sounding Out thank you is just my little way declaring bravo for a good resource. Take on my sweetest wishes for your next publication. His work is inventive and value. Thanks for this post exciting! The section of compelling content. Your blog is great for anyone who wants to understand more about. This is great. The way it is written, inspires me a lot and I wish for more such informative aspects.keep on posting such ideas and information. Hi there, really nice job,There are many people searching about that now they will find enough sources by your tips. I can not believe there are so many people commenting on your blog. Hi Brittany. Thanks for the information on how we could help these people. God bless you. Nice article and I agree with almost everything, but I think you create a new problem, where people are forced to make their point in the first three lines or 140 characters which isn't necessarily a good thing. It is great to know that blogs can also be used for campaigns such as this. More power to the organization! I think a very important part of your blog is represented by your so many comments. I wonder i found this post sudden. thank you very much for sharing this post. This article has the detail description about the title mentioned and I am feeling curious to wait for more such posts. In fact the conclusive part need to be more descriptive. Important blog having interested information. Few times we ignore this sort of things & also suffer a lot as well. How ever we all can save a lot with the assistance of these all tips. May you continue to be a gift to these people. Thanks. Spot on with this write-up, I really think this website demands much more consideration. I’ll almost certainly be here yet again to read much more, thanks for that info. I will never forget that the sign is similar to cancer patients although some differences in colors though. Hi girl. You did a great job initiating this cause. Keep it up. you offer in your articles. I really believe you will do much better in the future. HI Brittany. I wish you will never be tired of doing works for charity. We are on your side girl. Hello. It's rare to see kind-hearted people like you who still have time for these victims. I admire your cause. Hi Brittany. Thanks for letting us know that there are a lot of ways to be of help to these victims. May God bless you and keep you. What I find tough is to find a weblog that may capture me for a minute however your weblog is different. While there may be many donations now, additional support will be needed in the coming months . This amazing research and information is going to help a lot of people. Thank you for taking the time to do the research and share it with all of us..
May your organization prosper and be blessed even more, so you can reach out to those in need. More power! Its hard to find some thing really healthy. Internet is a pool of websites and you have to drown in to it for good. I am pretty much happy to overcome all the difficulties and have some spare time to read and enjoy reading your blog. Thank you very much for the whole information.I agree with all the points mentioned here and noticed all your important points. I think it will help many people. Well, this is my first visit to your blog ! We are a group of volunteers and starting a new initiative in a community in the same niche. Your blog provided us valuable information to work on. I love seeing websites that understand the worthiness of providing a prime resource for free.